Russian Pushka Promotions and Paimander Sports join forces for a show April 22 in Tammerfors (Finland). Headlining the show is lightheavy Dayron Lester (4-0) who takes on Konstantin Piternov (20-8) in an eight rounder. 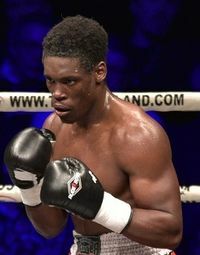 Lester (pictured) is from Cuba and claims around 300 amateur fights and is based in Finland through marriage to a Finnish lady. Word is he is for real and ready to go. He´s managed by Markus Lammi and trained by Kalle Helenius. This show was first set for February 12 but was for various reasons postponed. The headliner then was a fight at welter between Jussi Koivula and Roman Seliverstov. As things are now Koivula will fight on the undercard to Gianluca Branco vs Leonard Bundu for the EBU title on the same night as the Tammerfors show in Florence (Italy). Persistant rumors have it that Branco will pull out and Koivula, # 20 in the EBU ratings, step in.